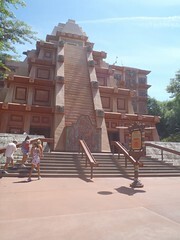 The Mexico Pavilion is one of the more interestingly designed ones at Epcot. The shops and ride are set up inside a Mayan Pyramid. It is always night in this Pavilion. Outside the Pavilion Mik and I enjoyed the cheese empanadas at La Cantina de San Angel. 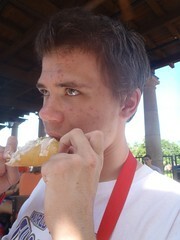 Mexican food is not any special treat considering we can get plenty of that kind of thing at home in Tucson, but Mik was hungry and he had never had empanadas before. To enter the Pavilion there is a ramp off to the side to get up to the doors into the pyramid. Once there you can go around and enter even from the front, but at least the side doors at the top of the ramp do have a button to open them. 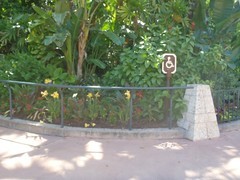 See review of Gran Fiesta Tour Starring the Three Caballeros Boat Ride here.